That little green rectangle in the above map is Grandview, Missouri, the latest city that’ll be able to enjoy gigabit Internet speeds from Google Fiber. Google announced its plans to bring its ultra-fast broadband network to the 24,500 residents of Grandview in a blog post yesterday, after Grandview’s Board of Aldermen voted in favor of offering its residents the fast-yet-affordable Internet and television service that Google Fiber promises. 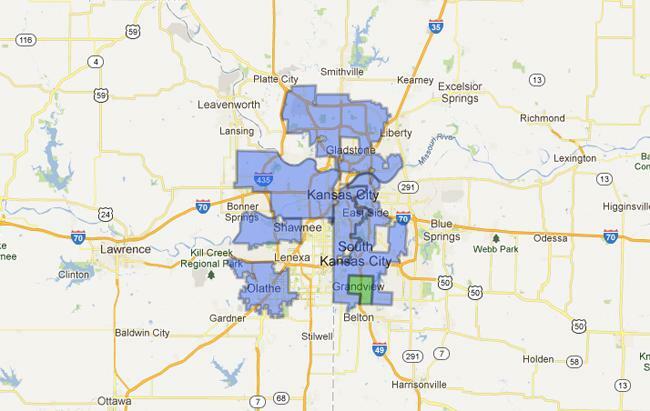 It seems Google is keeping its Google Fiber networks close together. After all, Grandview is just south of Kansas City, the first home of Fiber, and is within driving distance of the most recent additions to the Fiber family: Shawnee and Olathe, Kansas. The other lucky cities that have already been confirmed for Google Fiber are Austin, Texas, and Provo, Utah. In the meantime, Grandview residents need to get their neighbors on-board to sign up for Google Fiber when it becomes available since Google will only wire entire neighborhoods and not individual houses. After all, the service does charge a one-time $300 construction fee for the privilege of gigabit Internet (that fee is waived if you go for the $70 per month Internet-only or $120 Internet plus TV packages). But it’s hard to imagine that anyone would say no to Google Fiber as it offers the absolute fastest home broadband speeds available in the U.S. right now, as measured by Netflix’s ISP Speed Index. Where will Google be taking its Fiber network next?